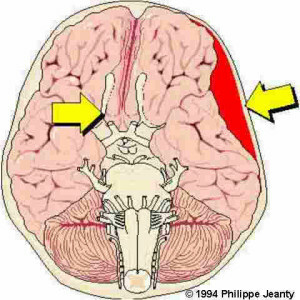 Cerebral compression occurs when there is a build up of pressure inside the skull. Cerebral compression can be caused by bleeding into the skull or swelling of the brain tissue after a head injury. It can also occur as the result of an infection (such as meningitis), stroke (Cerebrovascular Accident) or brain tumour. It is important for a first aider to be able to recognise the potential signs and symptoms of cerebral compression and seek urgent expert help. Change of personality such as irritability or confusion. Maintain the casualty’s airway if necessary. Be prepared to administer cardiopulmonary resuscitation (CPR) if the casualty stops breathing.